Provides a window that can be displayed over a parent window and blocks interaction with the parent window. A single object element that declares the content. Typically this is a class that can support additional content as child elements, such as a Panel class. A string that is displayed as content through the default template ContentPresenter. For more information, see "String Content of a ContentControl" section of ContentControl. The ChildWindow type exposes the following members. ChildWindow Initializes a new instance of the ChildWindow class. DialogResult Gets or sets a value that indicates whether the ChildWindow was accepted or canceled. HasCloseButton Gets or sets a value that indicates whether the ChildWindow has a close button. OverlayBrush Gets or sets the visual brush that is used to cover the parent window when the child window is open. OverlayOpacity Gets or sets the opacity of the overlay brush that is used to cover the parent window when the child window is open. Title Gets or sets the title of the ChildWindow. OnClosed Raises the Closed event. OnClosing Raises the Closing event. OnOpened This method is called every time a ChildWindow is displayed. Show Opens a ChildWindow and returns without waiting for the ChildWindow to close. Closed Occurs when the ChildWindow is closed. Closing Occurs when the ChildWindow is closing. HasCloseButtonProperty Identifies the HasCloseButton dependency property. OverlayBrushProperty Identifies the OverlayBrush dependency property. OverlayOpacityProperty Identifies the OverlayOpacity dependency property. You can use a ChildWindow to direct a user’s attention to a particular activity in your application, such as entering data or viewing information. To display simple information to a user, you might consider using a Popup or MessageBox. Consider using a ChildWindow when you want greater customization, you want to block the parent window, or when you want to retrieve a DialogResult and other data from the popup window. A ChildWindow always displays in a modal popup that blocks user interaction with the underlying user interface. The following illustration shows the parts of a ChildWindow. Overlay – the part of the child window that covers the parent window. Chrome – the part of the child window which hosts the Title and CloseButton parts. ContentRoot – the part of the child window which hosts application-specific content in its ContentPresenter part. The ChildWindow control includes the Overlay part, which covers the whole parent window. Therefore, when ChildWindow reports its size, it considers the size of the Overlay in addition to the size of the Chrome and ContentRoot parts. You typically define a child window by creating a new class that derives from ChildWindow. Alternatively, you can instantiate a ChildWindow directly. A child window can be the child of another child window. To display a child window, call the Show method. The Show method does not block the calling thread. This lets activity on the parent window, such as an animation, continue. However, user interaction with the parent window is not possible as long as the child window is open. By default, a user can close a child window by clicking the close button in the title bar, or by pressing the CTRL+SHIFT+F4 key combination. To close a child window programmatically, you can either set the DialogResult value or call the Close method. Setting the DialogResult value will automatically call the Close method to close the child window. You can cancel the close action by handling the Closing event and setting the CancelEventArgs.Cancel property to true in the event handler. If the close action is canceled, the DialogResult value will be reset to nulla null reference (Nothing in Visual Basic). To get the DialogResult value from a child window, handle the Closed event in the code-behind page of the calling window. In the Closed event handler, cast the sender parameter to a ChildWindow or a derived class to access the DialogResult property. 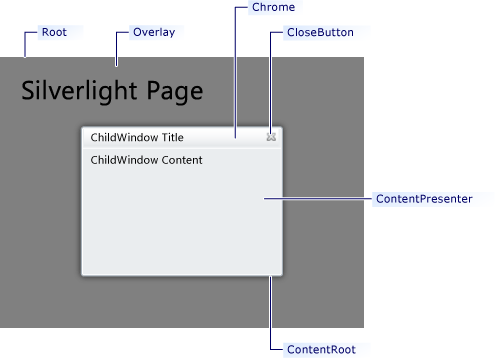 The ChildWindow control is available as part of the libraries in the Silverlight Software Development Kit (SDK). For more information, see the Silverlight Tools. In Solution Explorer, select your Silverlight project. On the Project menu, click Add New Item. The Add New Item dialog box opens. In the Category pane, select Silverlight. Enter a name for the child window and click Add. You can set the Title to be any object. This lets you create complex titles with text, graphics, and animations. If the object does not have a visual representation, the string representation of the object returned by the ToString method will be shown in the title bar. You can modify the appearance of the child window overlay area by setting the OverlayBrush and OverlayOpacity properties. The default close button can be hidden by setting the HasCloseButton property to false. This can be useful if you want to prevent a user from dismissing the information displayed in the child window. For example, you might display a video message and then close the child window automatically when the video is finished. If the default close button is hidden, you should call the Close method in your code to close the child window or provide an alternative way for the user to close the child window. You can customize a child window every time it is opened by overriding the OnOpened method. In the OnOpened method, apply conditional logic to set the properties of the child window. To apply the same property settings to multiple ChildWindow controls, use the Style property. To change the visual structure and visual behavior of a ChildWindow, copy and modify its default style and template. For more information, see Control Customization. To apply a template to the whole ChildWindow control, including the overlay, chrome, and content areas, set the Template property. To apply a template to only chrome and content areas, set the ContentTemplate property. Dependency properties for this control might be set by the default style of the control. If a dependency property for a ChildWindow is set by its default style, the property might change from its default value when the ChildWindow appears in the application. For more information, see Dependency Property Value Precedence. You can get the default style and template for ChildWindow from ChildWindow Styles and Templates. Setting a visual property will only have an effect if that property is both present in ChildWindow control's default template and is set using TemplateBinding. You can find a list of visual properties in the "Changing the Visual Structure of a Control" section of Customizing the Appearance of an Existing Control by Using a ControlTemplate. The following code example demonstrates how to use a child window to get login credentials from a user. The LoginWindow class is derived from ChildWindow. In the main page of the application, the LoginWindow is instantiated and displayed when the login button is clicked. If the user submits their login credentials with incomplete information, a second ChildWindow is displayed with instructions for the user. When the user submits their login credentials, the LoginWindow is closed and the main page displays a greeting to the user. The following XAML and code show the child window. cw.Content = "Please enter name and password or click Cancel." The following XAML and code show the parent window that calls the child window. The following code example demonstrates how to use a child window as a splash screen. The SplashWindow class is derived from ChildWindow. In the main page of the application, the SplashWindow is instantiated and displayed when the page is loaded or when the button is clicked. The SplashWindow displays one of two videos that is randomly selected in the OnOpened method. It closes automatically when the video is finished. The splash window uses a custom OverlayBrush and does not have a close button. <Button Content="Show Splash Window" Click="Button_Click"